I'm a little fanatical on the subject of backing up my computer. I do a full-scale backup every week, and if I'm working on something important I'll back up every night on my thumb drive as well. This habit -- ingrained into me by my engineer father -- has saved my bacon any number of times. One time a few years ago, my computer literally up and died, no hope of recovery. No worries -- my full-scale backup was from the week prior, and my important text had been backed up the night before. My losses were minimal. So anyway... this morning I followed a reader's link to her blog (Oklahoma Transient) which led me to another blog called Living Prepared. This fellow had kindly taken the time to explain how to back up... a blog! Honestly, it's something to which I never gave much thought. Blogs are always just... there, aren't they? Apparently no. He references a lady named Granny Miller who used to keep a nifty blog (I believe I've been there, and it was indeed nifty). But something happened and her blog disappeared. As Living Prepared put it, "Years of priceless information gone forever!" The thought made me shudder. I love my blog and would hate to lose it. So following the directions outlined on Living Prepared, I backed it up. For those wanting to back up their own blog, here's the directions, which are quite simple. First I went into my computer and cleaned out a lot of unnecessary stuff (you know how documents pile up). I emptied my computer's trash. The thousands of photos I took in 2011 were transferred to my external hard drive (something I'd been meaning to do anyway). In short, I made a lot of room on my computer. Then I went to the "Settings" feature on my blog. At the top are three links: Import Blog, Export Blog, and Delete Blog. I clicked on Export Blog. From that page is a big orange button that says "Download Blog." I clicked on it and then went out to feed the cows. My blog is huge and it took about half an hour to get it all backed up. This download feature did not give me the option of where to put my blog, but at least I know what the file was called: blog-04-17-2012. So once the backup was created (42,047 KB in size), I transferred a copy to my external hard drive. So now, as of this morning, I have an exact copy of my blog filed in two separate locations. Whoo-hoo, what a nice feeling of security! Not to be outdone by this excellent information, Living Prepared gave another nifty suggestion: to create a pdf version of my blog (which could ultimately be printed in book form if I so desired, but I won't bother). Nonetheless I considered this yet another handy backup feature, so I went ahead and did it. 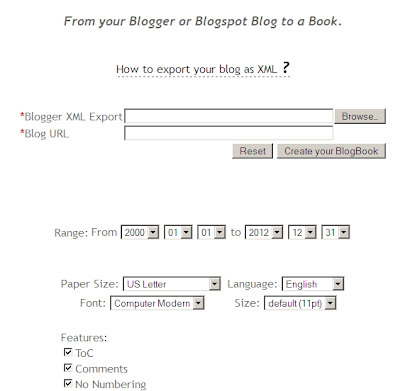 I went to a link called Blogbooker, which is a free service that creates pdf's of three different types of blogs (Wordpress, Blogger, and LiveJournal). I filled in the required information and pressed "Create your BookBlog." Well, this process took hours. Well, maybe two hours. My blog is huge, after all, and goes back several years and includes thousands of photos. Having this process take so long was no surprise. Grunt. Well, as of this post I'm trying it again. But regarding of whether I can manage to obtain a pdf of my blog or not, the fact remains it's now safely backed up. My sincere thanks to Living Prepared for posting this information. I tried the "export feature" also and it appears that the template,comments, and written posts are downloaded. I don't think any of the pictures are. I'm not that computer savvy, but that is how it looks to me when you open the downloaded file and look at it. Oh my gosh! I didn't know I could do this! Thank you, thank you, thank you for posting this! I will be doing this tonight! Patrice, I must say we all need to backup our blogs. 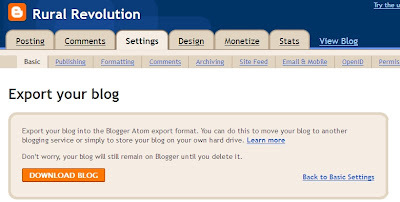 I would hate to have blogged for over a year and have my blog crash. Mike at Living Prepared has some great suggestions/ideas. I borrowed his about water filtration. Thank you so much. I now have a pdf of all my blog, all 195 pages with all the photos and comments . now I just need the ink to print it all!!!! there usually is not alot on the internet that i cannot live without, but backing up something important to you is the smart thing to do just in case. and every now and then, i am totally relieved that i printed that e-mail and filed it the old fashioned way. Glad the blogger back-up information worked for you. Maybe we will start something that will spread to the other bloggers and save them from a major heartbreak. As for the BlogBooker it took me three times before it worked. I've used it before and had no problems, maybe they are getting a lot of users and their server gets server cramps :-) The Blog Book is really cool especially with the table of contents that lets you pick the article you're looking for. I need to do this. I backed up my husband's old blog with another application once that basically mirrored it on your hard drive. I had forgotten about that, though, and I need to back his up and mine. Thank you!